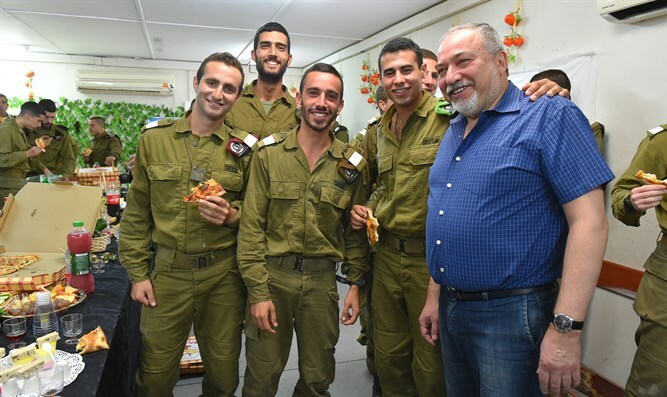 Defense Minister Avigdor Liberman arrived this afternoon at the Herodion post with the head of the Central Command, Major General Nadav Padan, and met with the Armored Corps soldiers stationed there to express his thanks to IDF soldiers responsible for the security of the Bethlehem area south of Jerusalem, including the community of Nokdim, where he lives. “The fact that all the people of Israel will be able to sit around their tables today and celebrate the new year quietly and in security is mainly thanks to IDF soldiers, who will continue to patrol and protect us all. “In Judea and Samaria, even in recent days, almost every day we have arrested suspects and have prevented terrorist attacks 24/7, all thanks to the concerted and intensive work of our soldiers, which enables us to truly exist, to rejoice and develop. Thank you all, have a sweet and happy new year."